Can you be a Modern Quilter but not make Modern Quilts? My quilty friend Crystal has been hosting the fantastic Modern Quilting, Modern Women series over on her blog Raspberry Spool. Today she posted an interview with the resplendent Mary Fons. 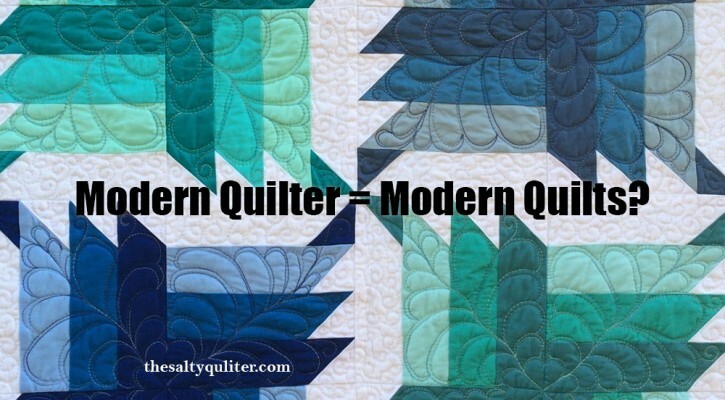 I’m a modern quilter only if you take “modern” to mean now. I think that word actually can’t be used in this way, however, because of the genre we have. So I consider myself a “contemporary” quilter but in every other way a quilter can be modern today, I am. I used social media and video to do a lot of work; I lecture and teach and all that business (booking, promo stuff, blog posts, ticket sales, etc.) happen well and quickly because of the Internet. If you don’t make “modern (style) quilts” can you consider yourself to be a “modern quilter”? This is certainly not a new topic. Many different bloggers have covered this same ground, several coming up with different answers (embrace it, ignore it, who cares?). So I’m not exactly covering new ground. And obviously it’s the MQG’s show; they can pick who they want to be in it. My hypothesis is that they really wanted to show a strong differentiation between modern style quilts, and traditional, or merely contemporary style quilts. Shortly before this, I watched Jacquie Gering‘s MQG webinar (only available to MQG members) about the definitions of the modern quilting style. Not gonna lie – I felt like I was going through the five stages of grief watching this webinar. I realised then that the majority of the quilts I make are definitely not modern and those that are, are barely blips on the modern spectrum. I had the opportunity to take a straight line quilting class with Jacquie at QuiltCon in 2015 and both she and the class were lovely. Unfortunately, I had almost completely lost my voice at the time, so I couldn’t take to the opportunity to further discuss my response with her. Now that the Modern Quilting Movement has effectively entered its adolescence, the MQG (effectively the governing body and leader of the movement) will need to decide what’s more important – a descriptive style of quilting or people. In the end, for the movement to be successful and enduring, it will need to side with the people. Styles and trends come and go, but people will always remain. Like Mary Fons, my quilting and participation in the craft has been shaped by the people around me, including and especially, on the internet. My quilts may not be “modern quilts”, but I am most certainly a modern quilter in attitude. I’d love to know your thoughts. Do you consider yourself a modern quilter? This entry was posted in Salty Rants and tagged in Modern Quilting. I wrote this on Facebook in response to someone sharing this link. I thought I should copy it here. Terri Kriebel Schurter This resonates with me. I consider myself a modern quilter because my thought process is modern even if the resulting product may have been arrived at through traditional techniques. In art school 40 years ago, I used knitting, crochet, weaving, and quilting to complete assignments in color theory classes for my fine arts degree. I was trying hard to legitimize my chosen media in an art world that worshiped the brush and denigrated the needle. Maybe the MQG is bending over backwards a bit to distinguish what we make from craft. Perhaps that battle doesn’t need to be fought anymore. Hi Terri, you make an excellent point here. For so long the “crafts” part of “arts & crafts” has been denigrated as “women’s work”. As a feminist, one of my goals is to ensure that just because something is considered feminine or domestic, doesn’t mean it’s less valuable than something masculine. Is it the MQG’s job to fight that battle? Probably not specifically – it’s a societal shift that will have to occur, and it’s up to people like us on the pointy end to ensure it does. Thanks heaps for your comment and getting me thinking. I might write more in a future post. This is a very important and relevant topic, and you addressed it beautifully. Thank you! As a local MQG leader for three years, I can attest to the fact that people are judging their work as “not modern enough” when really there is room for all of us. And if you don’t consider your work modern, that’s okay too. While we are a modern quilt guild and thus run our meetings from a modern perspective, there are so many more layers to modern than just the MQG definition. It’s my goal to get that message out there! Thanks Jess! Glad to know there are others who feel the same way. I feel so #blessed to know the many wonderful people in my local Modern Quilt Guild and from those around the world. I think the problem is that the term modern really isn’t appropriate to define a style. Because this year is a new modern and last year’s stuff is no longer modern. I am a modern quilter because of the internet, the many resources that are available to me in terms of fabric, tools, and ideas, and the worldwide quilting community from whom I can seek advice. I am modern because I am not limited to a particular style or genre. I can make my quilts whatever way I want. I have tried making a modern style quilt, but somehow I wind up putting my stamp on it that takes it out of the genre. But I think that makes me more modern than modern quilters, because I am choosing today’s ideas instead of somebody else’s definition of “modern”. Good point Shasta. “Modern” is one of those words that’s been co-opted by so many movements and marketers, it has probably ceased to be a specific definition. I find this topic so interesting. I would never have considered myself a traditional quilter, but according to the strict definition, I am not a modern one! What I think is a better question is “what is a traditional quilter?”. A couple of years ago, I inherited a fabric stash from a woman who had passed away. The stash consists mostly of prints that give me nightmares. Lots of little cranberry color flowers and teal blue leaves on a beige background, which I think most people would consider quite traditional. But when I look at it, I start to think that it actually was modern….in 1989. What I’m trying to say is that using traditional batiks or those homespun ginghams would have been considered wildly modern by someone from the 1930’s, or 1870’s. If the definition of “modern” does not evolve, then in 10 or 15 years there will be a new quilt movement, defined by another set of criteria. And the pioneers of that movement will consider lots of negative space, alternate grid space, etc, as a dated look. Sorry for the novel. I just think about this a lot. You know, the last time I was in Joanne’s, purchasing Denyse Schmidt’s last line, an older woman was next to me at the cutting counter. The fabrics she was having cut told me she was a “traditional” quilter. She loved what I had chosen and didn’t bother distinguishing between modern and traditional. Which is a good thing. No worries Barbara. Obviously this is an interesting topic for lots of people. I agree with you about the fabric – it reminds me of Weeks Ringle and Bill Kerr’s message that any type of fabric can be included in a “modern” quilt. Thank you, Coral, for such an honest post. I agree with you – I’m far from being a modern quilter, and am much more a contemporary…though the techniques (both online and off) are very much modern. Agree it will be interesting to see how the MQG addresses its adolescence phase of life! I love your thoughful post. You make some great points. The term and the idea of modern does not belong to the MQG, its been an art reference for a long time. Its cool that they use it and its cool that that other quilters use it too to describe their own version of what is modern, or being made now. I love that the MQGs are attracting new members. But as you said, its people that will sustain the movement, not styles.